View of “Organizing the World,” 2011. Showcasing his forty-year career in an extraordinary range of media, Matt Mullican’s retrospective assails viewers with the structured disorder for which he is known. 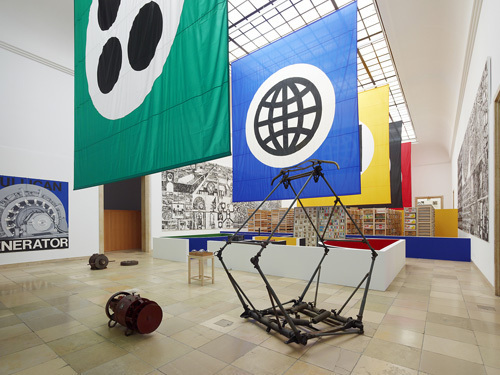 The exhibition’s title, “Organizing the World,” is somewhat misleading, given that his “sign systems,” as he calls them, are arranged eclectically and elude straightforward comprehension. Mullican’s work essentially explores the way that signs, including language, can obscure the role that intuition or self-generated knowledge plays in one’s navigation through life. This paradoxical position is intensified by the sheer range of work on view and the scale of the exhibition, which results in a difficult yet rewarding viewing experience. Mullican’s work here evinces its crucial place in the progression of Conceptualist practice in America, emerging from John Baldessari’s influence at CalArts in the early 1970s to add his own brand of ontological aporia to the mix. Of course, no survey of Mullican’s career could be complete without an examination of his work on hypnosis or his unique take on the notion of alternate worlds. These themes are skilfully amalgamated in Learning from That Person’s Work, 2005; a mazelike display of paintings interspersed with multiple videos that depict the artist in a trance state. During a live performance at the Haus der Kunst, a hypnotized Mullican reenacted, in a quasi-autistic style, a stereotypical domestic scene that involved reading a newspaper at a breakfast table before heading off to work. This scenario was regularly punctuated with moments of crisis, during which he obsessively repeated phrases such as “I’m a fake, this isn’t any good,” in defiance of the narrative structure. Like the exhibition itself, the performance was riddled with glimpses of self-conscious doubt about whether his artistic forms could actually transcend their function as signs. Due to this brilliantly double-edged quality of his practice, the exhibition benefits from repeated and protracted visits, acquiring further nuances and complexities over time.